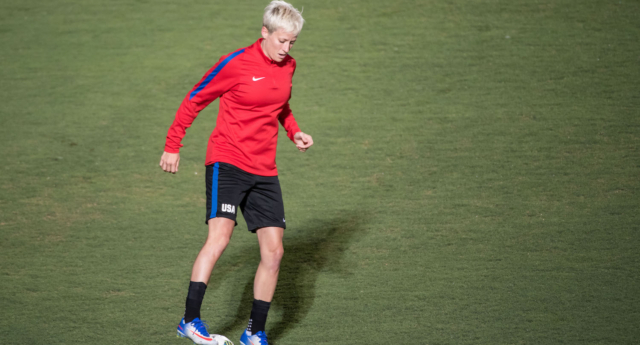 Female soccer star Megan Rapinoe has opened up about fighting for equality and inclusivity in sport. Rapinoe, who has faced numerous counts of homophobia on the pitch, revealed that she will not stay silent about the discrimination that surrounds her sport. Talking to the Guardian the 31-year-old spoke explained her previous protests, such as kneeling during the national anthem, and her future plans to tackle inequality. The athlete explained that she was motivated to help the fight for equality after reading more about injustices that LGBT and BME people face. She said: “The more I’ve been able to learn about gay rights and equal pay and gender equity and racial inequality, the more that it all intersects. “You can’t really pick it apart. It’s all intertwined. God forbid you be a gay woman and a person of colour in this country, because you’d be really f*cked. “You can’t really speak out on one thing and not another without it not being the full picture. We need to talk about a larger conversation in this country about equality in general and respect – especially with the recent election and subsequent narrative that’s coming from the White House right now,” she added. Rapinoe said that there was no way to “perfectly” protest, but she wouldn’t have changed the way that she protested in the past. “I don’t think there’s any perfect way to protest. I think if there was something else being done, something else would have been said about it,” she said. “I can’t look back and say that I would have done this different, this different or this different. “It’s really obvious that we have very serious inequality in this country across many different spectrums. For Rapinoe, conversation is crucial to equality and her “open mind and heart” help her to talk about issues that she and others face. She added that those who disagree with her will hopefully keep having that conversation and eventually “open up”. “I hope to continue to have the conversation. Hopefully people who disagree with me continue to have the conversation and we can kind of open each other up even more than we already have,” she added.